Before Plassey, British commercial interests were concentrated in and around the original Fort William at approximately the site where Job Charnock had established his East India Company trading settlement in 1690. The British generally resided in Fort William and its immediate vicinity, besides some individuals living in European garden houses at various locations within a three mile radius, including in the portions of the city subsequently known as the Black Town. [See Archer] The pivot of the settlement, as Cotton describes, was ‘Lall Bagh’ or the Park. In the centre was ‘Lall Dighi’, or the Great Tank, which had been in existence before Charnock’s arrival. Within the Park there was the enclosure of the Cutcherry house of the local Jaigirdar, Laksmikanta Roy Majumdar Choudhury (1570-1649). It was then the only conspicuous masonry building in the locality, the Portuguese Mass-house apart. Job Charnock had acquired the Cutcherry house for Company’s officials to stay and to store up Company’s records. The local name of the Park area was supposed to be, ‘Lal Bagh’ or ‘Lall Bagh’, and the name of the Pond, Lal Dighi, or Lall Dighee’. The word ‘lal’ or ‘lall’ in vernacular stands for red colour. Interestingly, every anecdote that attempted to establish the origin of Lal Dighi went by explaining the use of the attribute ‘lal’ with some historical references. None of those, however, explained the origin of such names as Lal Bagh, Lal Bazaar, Lal Girja. There remained other possibilities to explore, like ‘imported names’. Calcutta might have imported a Lal Bagh from Murshidabad while under Muslim power, like the Londons in US were. Alexander Hamilton wrote in 1702 that the Governor ” has a handsome house in the Fort;the Company has also a pretty good garden, that furnishes the Governor herbage and fruits at table, and some fish ponds to serve his kitchen with good carp (পোনা), callops (শিঙ্গি, মাগুর) and mullet (বাটা). William Carrey suggested that the Tank inside the Park was one of these fish ponds, and the garden might have been the Tank Square, which was within easy reach and much nearer than the Company Garden at Middleton Street. Dalhousie Square, photograph taken by A. De Hone in 1870s. New GPO appears at the west end. As mentioned before, the major improvement of the Tank and the Park was made during the tenure of Warren Hastings. Since then many a change in the Tank Square and its ambiance have taken place by degrees under different Bengal Governors and Governor Generals. Lord Curzon, however, took a special initiative for its beautification. 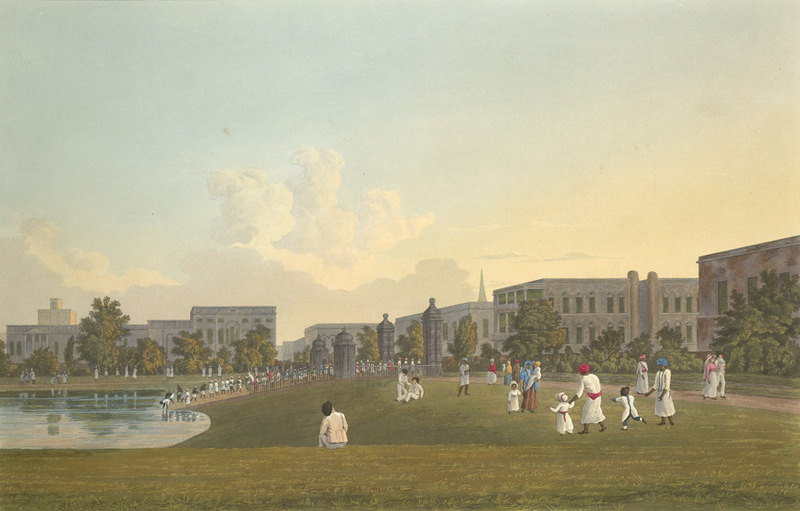 The end of 19th century witnessed a picturesque scenario of the Dalhousie Square surrounded by the grand old constructions and the new GPO.